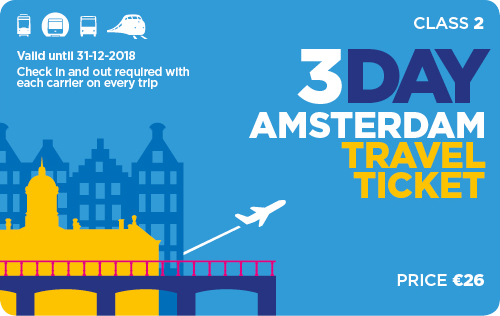 With the Amsterdam Travel Ticket, you can travel across Amsterdam without limits for the chosen days. A 2nd class rail travel ticket between Amsterdam Schiphol Airport and any station in Amsterdam is included. A shuttle service to and from Schiphol airport by the Amsterdam Airport Express (bus 397) and Niteliner (N97). With each ticket you can travel in all buses, trams, metros and ferries operated by GVB. A local map and suggestions for sightseeing is included, so you won't miss the highlights of Amsterdam. Save money by buying a 2-day or 3-day ticket and get a discount up to %. Explore the canal rings to soak up the great atmosphere and find authentic shops. Visit the Rijksmuseum for some serious culture and the Anne Frank House for a touch of history. Go and have a drink in one of over 500 cafes and meet the locals. Have you been to Amsterdam before and you like some contrast, then jump on the ferry boat that leaves from Amsterdam Central Station at the waterfront exit of the station and head North. Enter the creative hub of Amsterdam Noord. Easily cover the whole of Amsterdam with your 1, 2 or 3-day Amsterdam travel ticket. From Schiphol Airport you travel straight to the city center by train or bus. From there a tram or metro takes you wherever you want to go in Amsterdam. Please order your ticket online. After you have purchased your ticket, you will receive a voucher via email. 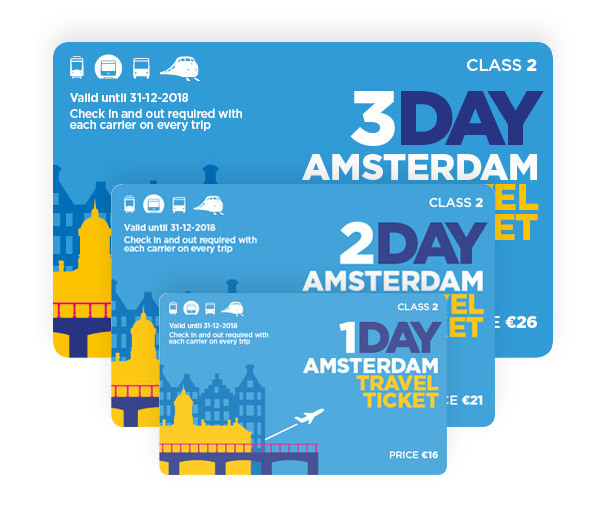 With this voucher you can collect your 1-, 2- or 3-day Amsterdam Travel Ticket at the NS Train Services & tickets shops on one of the following train stations: Almere Centrum, Amsterdam Amstel, Amsterdam Central, Amsterdam Sloterdijk, Amsterdam Zuid, Den Haag Central, Eindhoven, Haarlem, Hilversum, Maastricht, Rotterdam Central, Schiphol Airport or Zaandam. 1-day (€ 17), 2-day (€ 22.50) and 3-day (€ 28) tickets are available. Included is a handy map showing places of interest in and around Amsterdam. Please note this is not a 24 hour ticket: a ticket is valid from the moment you check in for the first time until 04:00 the next morning. Only available for 2nd class. This ticket is valid for 1, 2 or 3 consecutive days. A day in this context begins at 00:00 AM and ends the next day at 04:00 AM. The validity starts from the moment you check in. Unlimited travel to and from Schiphol Airport by NS train to any station in Amsterdam and by the Amsterdam Airport Express (bus 397). GVB, recognizable in the colors white and blue, provides you with: tram, bus, metro and ferry.